Canon’s DSLR cameras use a pre flash to determine the correct flash exposure, a system known as E-TTL. Way back in time, Canon EOS film cameras used a system called TTL flash where the flash was metered off the film surface during the actual exposure. Several of the Speedlite EX series of flashes are possible to be configured for either kind of flash metering system. By default Speedlite EX series flashes are set to E-TTL, but a custom function allows them to be changed to the older TTL system. If you’ve been messing with the flash custom functions (C.Fn) then it’s possible to set your flash to TTL, then on most DSLR cameras you get a lot of trouble. Fortunately the LCD display on the flash shows different indications, ETTL for ETTL mode and TTL for TTL mode – kind of obvious. If you incorrectly set TTL mode; the flash will fire at full power all the time, or not fire at all. You also won’t be able to set wireless flash operation. The problem is that when the error is relayed via the internet the E is often left out of the ETTL and so TTL and E-TTL become interchangeable in a discussion but they are not interchangeable in use. So why does this function even exist? It’s to do with compatibility; Canon DSLR cameras only have E-TTL metering, some* of the film cameras have E-TTL and TTL to allow them to be used with either more recent flashes or older ones. Older Canon flashes from before the Speedlite EX series only provide TTL flash, not E-TTL. Most photographers would not venture in to C.Fn 05 / 03, but with the release of the Speedlite 580EX II Canon added External Auto and External Manual metering modes – kind of like the old thyristor metering in old flashes. 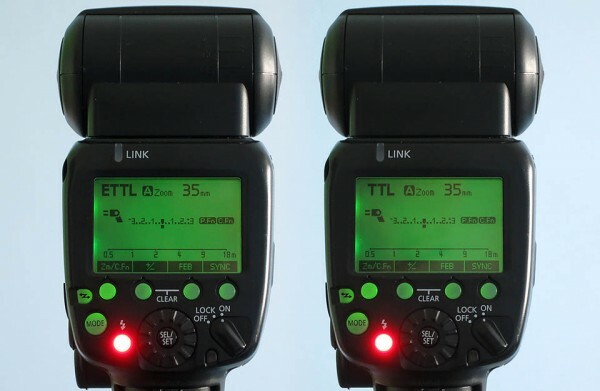 Canon opted for C.Fn 05 to have four possible values and so some people may be confused when switching back from the External metered modes as to which is the right mode TTL or E-TTL. Many thanks to Devon based photographer Scot Baston for asking the question that gave me the content to write this post. Scot further added the complexity of Pocket Wizard TT5 and a Sekonic L-478DR meter to the problem. It should have been possible for Scot to set the power of a flash directly from the Sekonic meter, but with the Speedlite 580EX II having C.Fn 05 set to 1, it never could. More fantastic information Brian. You’re such a wealth of knowledge and you’re very generous in sharing it. You’ve helped me in so many ways – including opening up a whole new ‘Speedlite world’ to me – thank you! Thanks for the kind comment Julia, glad that the Speedlite world is less of a scary place for you nowadays. It’s a good tip to have in the back of my noggin if this occurs. Jonathan I think the phrase is “messing with the custom functions” combined with not reading the manual [NRTM]. It’s a challenge to accidentally set the 430EX II to TTL instead of E-TTL. Basically the flash detects the type of camera and for older ones it shows TTL, for newer ones it’s ETTL. When I say older cameras I’m talking film-era EOS. What camera are you using it with? I have the same problem. I have a Speedlite 600EX-RT on a Canon 70D. I have wiped down the connections, so hopefully it wasn’t that. It has worked on ETTL for a couple of years. The Speedlite 430EX III-RT would be a great match for your EOS 80D. You can use it on the camera hotshoe, set to E-TTL for simple automatic flash with more power than the cameras’s built-in flash. You can move the flash head to bounce the light from a ceiling or wall for more flattering results. When you’re ready you can use the flash off-camera set to optical receiver (slave) mode and configure your EOS 80D built-in flash to control it. IF you get really in to off-camera flash and want to work in brighter sunlight – where the optical system is not so good – you could add a ratio trigger such as the Speedlite Transmitter ST-E3-RT. For 200AUD then you might want to take a look at the Yongnuo YN600EX-RT II flash. It’s $169 on Amazon Australia. It’s a clone of the Canon 600EX-RT but not weather sealed, and the build is cheaper quality. But it’s a lot of flash functions for the money and does work with the Canon radio flash units if you need it to later.